Human nature has always been driven by fear & greed and it will continue to do so. How else can we explain the dotcom boom and it's subsequent bust? Or the market bottom of 2009. Prediction is very difficult, especially if its about the future . In my opinion, discounted cash flow is a futile exercise as it based on predictions and assumptions, which makes it highly susceptible to cognitive biases and subsequent errors. One can look at the past performance of the company but no one has seen the future. As they say, past performance is not an indicator of future performance. There is no denying that stock market is forward looking. The questions is - how much forward looking is it? Next quarter, next year? Certainly not next five years. For the long-term investor this is a good thing. Every bear and bull market is different in its own way but humans for the love of classifications will continue to classify these with past bear and bull markets. All companies are not created equal. There are good companies and there are so-so companies. Just like smart and hard working people with right attitude, good companies can take a blow or two and still survive and come out on top. Temporary distress or obstacles can provide excellent buying opportunities. John Keynes said, "When the facts change, I change my mind. What do you do, sir?" We live in a constantly changing world. At some point of time, every industry and every company will face changing landscape. It is the ability to adapt to change (foreseen and unforeseen) that will keep companies from collapsing. In some sectors like technology, the pace of change is faster, hence the need to adapt faster. The point is that it is crucial to keep up with the company story. As Buffett and Peter Lynch often tout, competition kills profitability. High growth and hot industries attract a lot of competition which kills profitability. In the words of Peter Lynch, 'for every hot product in hot industry, there are 1000 MIT graduates figuring out how to make it cheaper in Taiwan'. Although its customers are in an highly cyclical industry I would classify ARM as a fast grower. Semiconductor industry is a highly cyclical industry. Technology sector is marked a rapidly and constantly changing arena. Introduction of a better mobile/non-mobile processor intellectual property or fundamental shift chip design can make the current product obsolete. ARM (British company) develops the blueprints that allow chipmakers (Qualcomm) to design their semiconductors. ARM's intellectual property has expertise in low-power high-performance chip architectures. It makes money on it's IP through up-front licensing fees and on-going revenue based on the price of each ARM-based chip sold. Its customers are semiconductor companies, original design manufactures and foundries. More than 75% of revenue comes from processor licensing and royalty fees. For chipmakers to abandon ARM's architecture and build a new one from scratch would require substantial investment. Strong network of handset firms, chipmaker (Qualcomm), software providers (iOS and Android) and software developers around ARM-based designs increase ARM's stickiness. ARM has also made major stride into non-mobile like networking and TV set top box chips. Broadcom using ARM based chips for their latest products. Texas Instrument's 32 bit microcontroller's are based on ARM's non-mobile designs. Increasing competition from Intel (Atom platform) as it tries to enter mobile chip market. Intel has made substantial progress in reducing the energy usage of its high-horsepower x86 chips. The growing use of high-end smartphones and connected devices is expected to be beneficial for ARM. The total smartphone unit sales is projected to grow at 10% annually. Growth of smart non-mobile devices such as automobiles and connected home products is likely to benefit ARM so apps previously developed for smartphones/tables can be easily migrated to these products. At the end of third quarter (2014), the average royalties per chip slid to $.045 from $.049 a year ago. Rise of low-end phone and competition in mobile processor arena likely to result in slower revenue growth due to lower prices and royalties for ARM. The following graph outlines the revenue growth of ARM (ARMH) in the last 10 years. 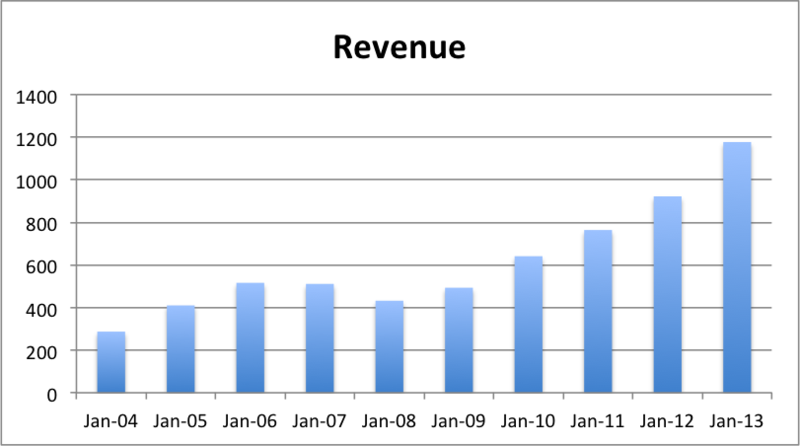 In the last 10 years, the total revenue has increased at an average of 18.22% and at a CAGR of 12.43%. Meanwhile, revenue per share has increased at an average of 13.75% and at a CAGR of 13.03%. In order to arrive at the owner's earnings, the 'Depreciation, Depletion and Amortisation' expenses have been added back to the 'Net income'. 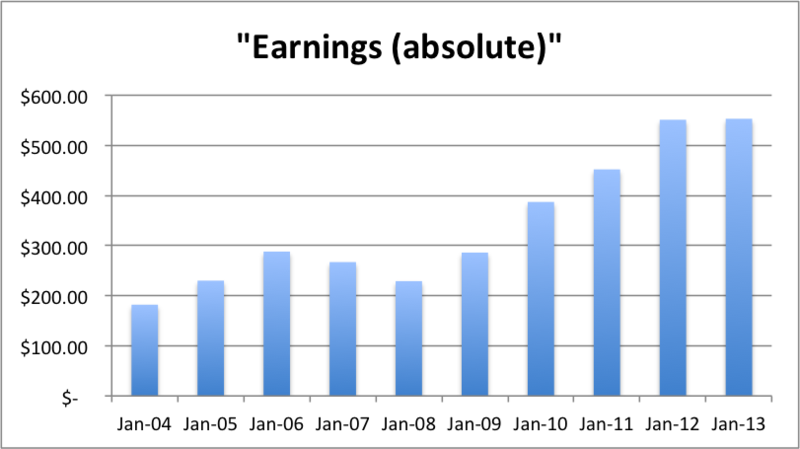 The table below shows the owner's earnings in the last 10 years for ARM (ARMH). ARM (ARMH) has delivered an annualised return of 20.48% vs 7.17% annualised S&P 500 return. 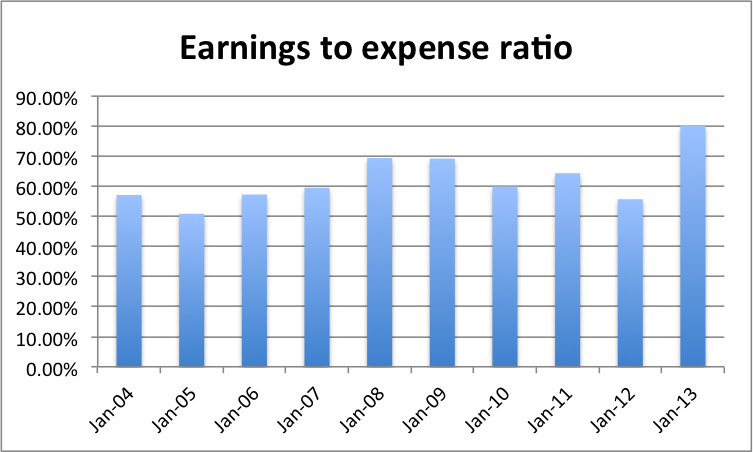 In the last 10 years, ARM (ARMH) has spent an average of 62% of its owners earnings on capital expenditure. In the last 10 years, the dividends have increased at a CAGR of 23.55%. Due to the effect of share dilution, dividend per shares on the other hand has grown at an average of 22.92% and at a CAGR of 20.23%. A CAGR of 20.23 implies, dividends doubling every 3.5 years. 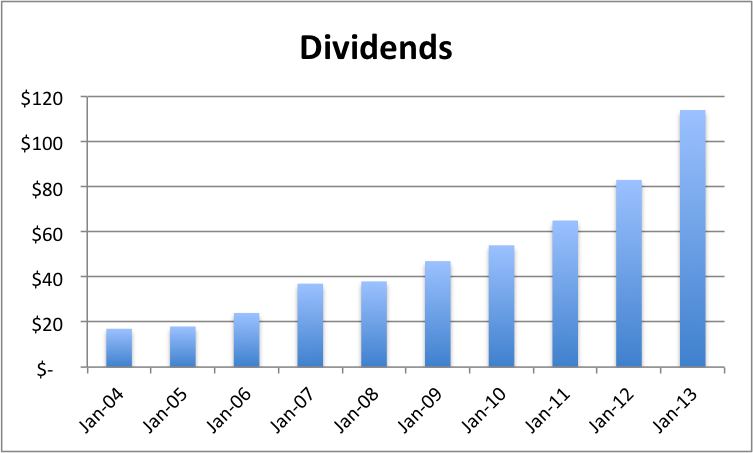 The dividend payout ratio is 20.6% of its total cash earnings. 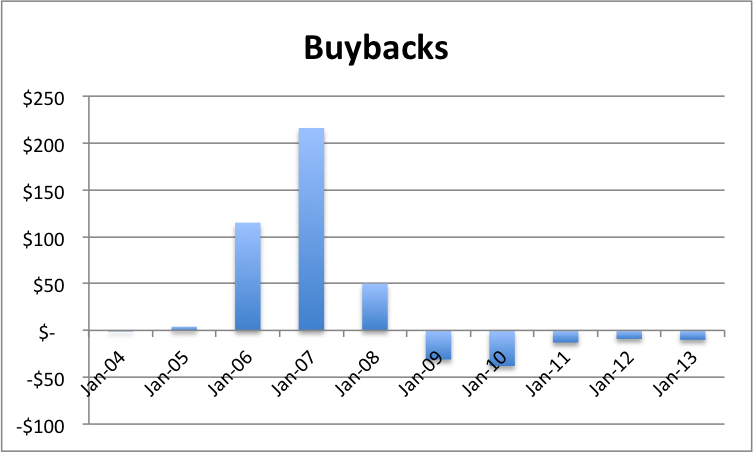 The graph below outlines the total amount of money ARM (ARMH) has spent on buybacks. This demonstrated management focus on creating shareholder value. ARM (ARMH) has increased the count of number of outstanding shares from 345 million in 2004 to 472.6 million as of Sep 14. 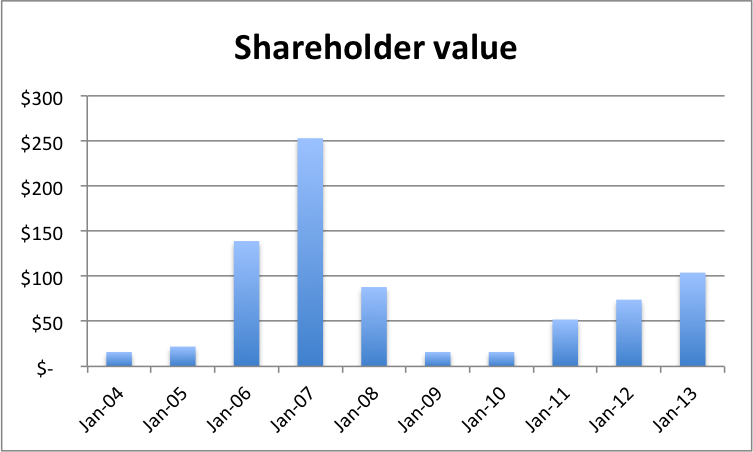 The graph below outlines the total amount ARM (ARMH) has returned back to shareholders in the last 10 years through dividends and share repurchases. On an average ARM (ARMH) has been able to return 25% of its total owner's earnings to shareholders through dividends and share buy backs. The total liability to earnings ratio is 2.08 which is quite good and meets my investment criteria. Although ARM is a healthy company, but it carries a lofty valuation and personally, I would not invest at this level.